People Working at Warwick Construction, Inc.
Warwick is a nationally licensed general contractor specializing in retail construction, ground up, tenant improvement and open store remodel projects. We have 6 estimators, 15 project managers and around 40 supers all with extensive retail construction experience. We work for retailers, developers, franchisees and construction management companies to produce projects on time and on budget. 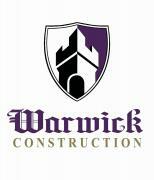 You should be a premium user to contact Warwick Construction, Inc.